A new year always sparks new plans and new ideas for me. Throughout January I have been making a list of things I want to accomplish before 2019 is up. A few of those are some home improvements. Along with redecorating the hallway and getting a new kitchen installed, I have some little tasks too. 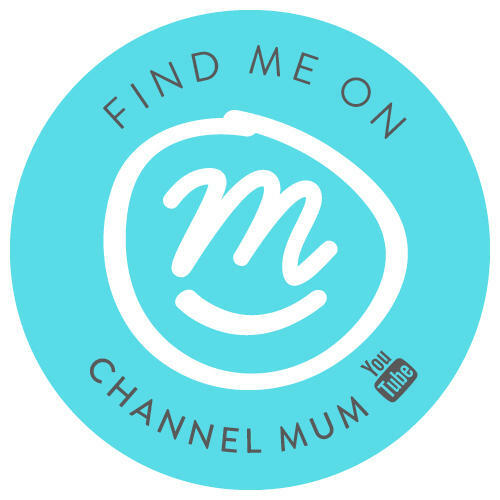 One being find some clever organisation/storage solutions (hello Pinterest) and the other being to inject a little more style and colour into the lounge and my bedroom. My house isn’t the biggest, nor the most modern or glamorous you’ll see, but it’s home. It’s where we have been for nearly 4 years and I love it. 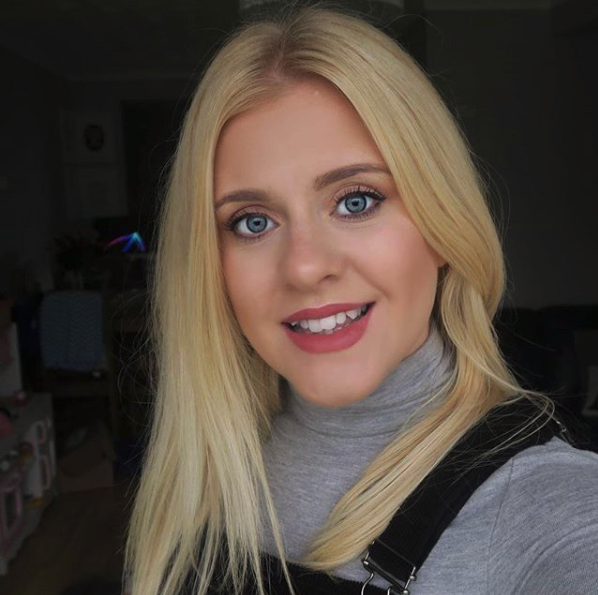 I wanted to get stuck right in with my tasks but with January being the longest month of the year and my bank balance still recovering from the pounding it took at Christmas I was looking for little touches that will make a big difference. Of corse my first thought was some new prints to add some subtle colour in a stylish way. My lounge is grey, with a grey rug and grey cushions but my favourite colour palette is grey with a blush pink and hints of gold. So this is what I went for. 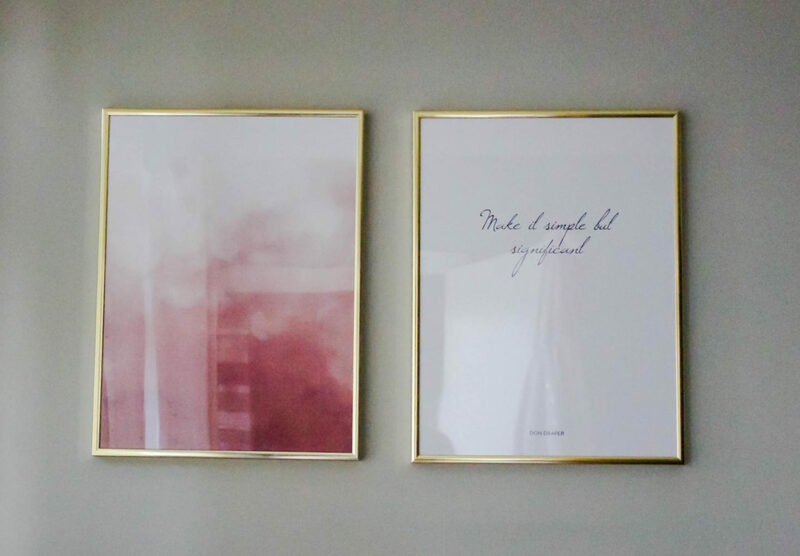 In this area used to hang a big canvas of my girls (sorry kids) I found these gorgeous prints on Desenio to fill the space. They’re simple, modern and I think they look fantastic. I am so so happy with them. I love how they have just instantly modernised this space as well as tying in the pink without being overwhelming. I love the quote ‘make it simple but significant’ it sums up our home perfectly. These prints are called Don Draper & Pink Clouds. I chose the gold frames, I felt like gold just added a little something extra. Prints from Desenio are so reasonably priced. 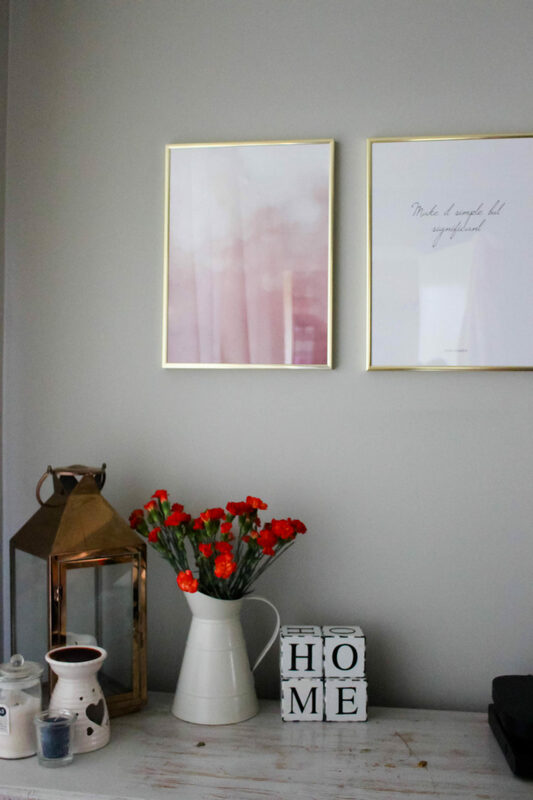 What’s great is you don’t have to buy them framed, you can just choose your prints making it a really inexpensive way to update your space regularly. Next to the bedroom. My aim here was just to make the room feel a little more ‘grown up’ I wanted to find something cool that I would look at and think YES! I found just that; I used Desenio’s perfect pair tab to find the inspiration I needed. It’s great to see the prints in a home setting, styled up to get a real feel for how they will look. 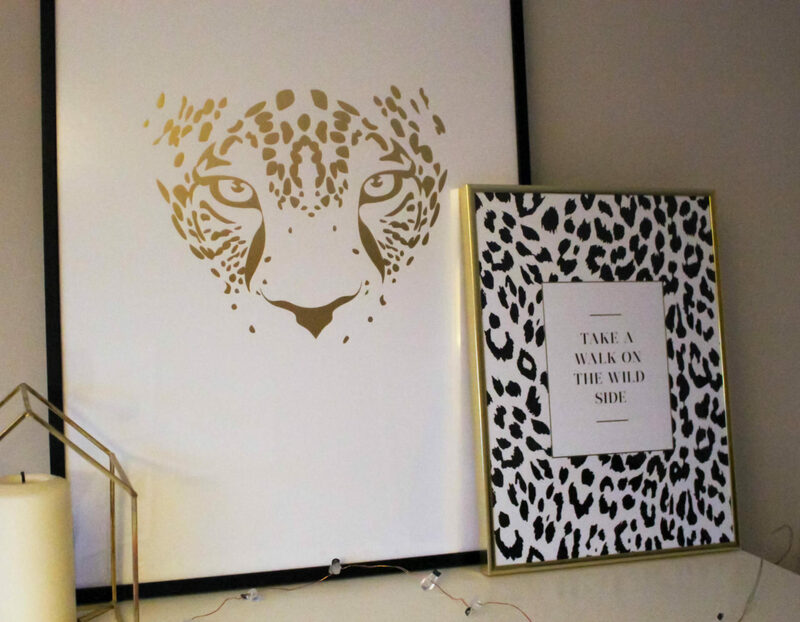 I was instantly drawn to this pair, firstly leopard print is so on trend right now and secondly I love the contrast of the gold and black. 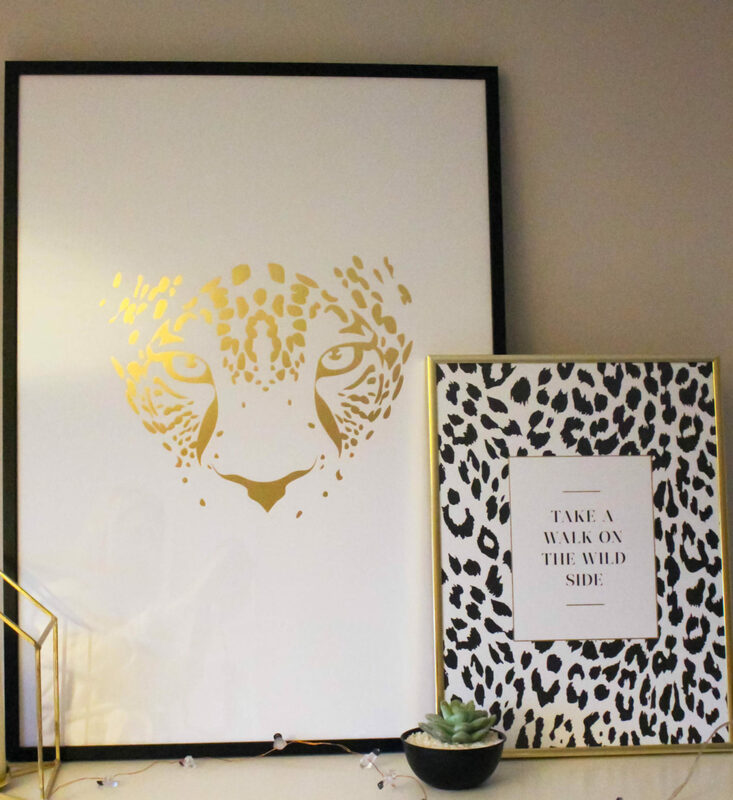 These prints are called Golden Leopard & On The Wild Side. 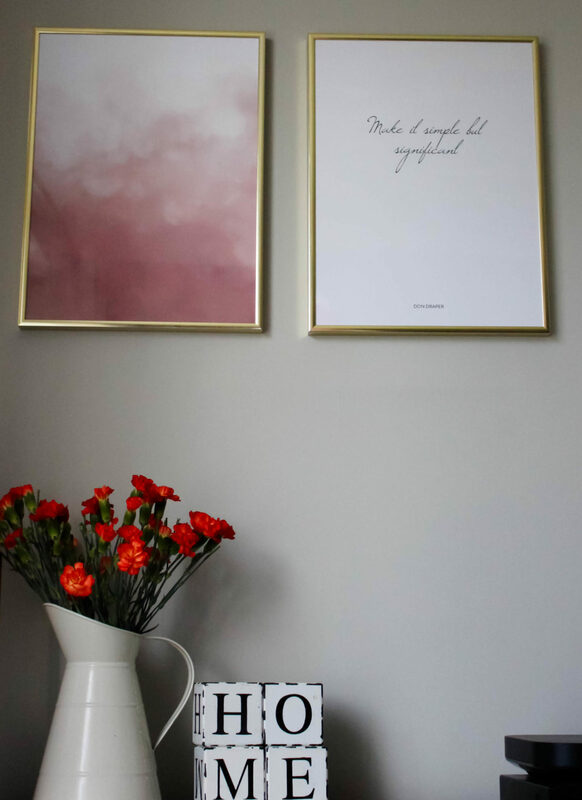 Desenio are my go to brand for finding new prints, they have massive selection to suit all tastes, the prints are so easy to choose and It’s really simple to put together a gallery wall or change up the sizing and frame colours to get exactly what you are looking for. Desenio were kind enough to give my readers 25% off when using the code ‘EVERYTHINGMUMMY25‘ this code is valid off posters between January 29th and 31st (except on frames and on handpicked-/collaboration/personalised posters). Happy shopping guys! Make sure you come back and let me know which ones you picked.